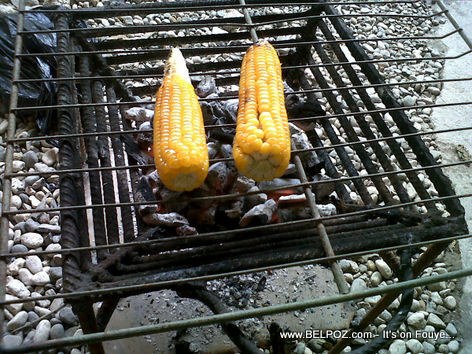 Look at this photo... 2 corns on the cob being grilled on top of a Haitian charcoal stove. Grilled corn on the cob is called Mayi boukannen in Haitian Creole. It is a favorite snack in Haiti, especially during the rainy season when corn is abundant in Haiti. Gade photo saa... 2 mayi ki ap boukannen sou dife Haiti. Epòk Mayi an Haiti ou jwen mayi boukannen tout kote an Haiti.